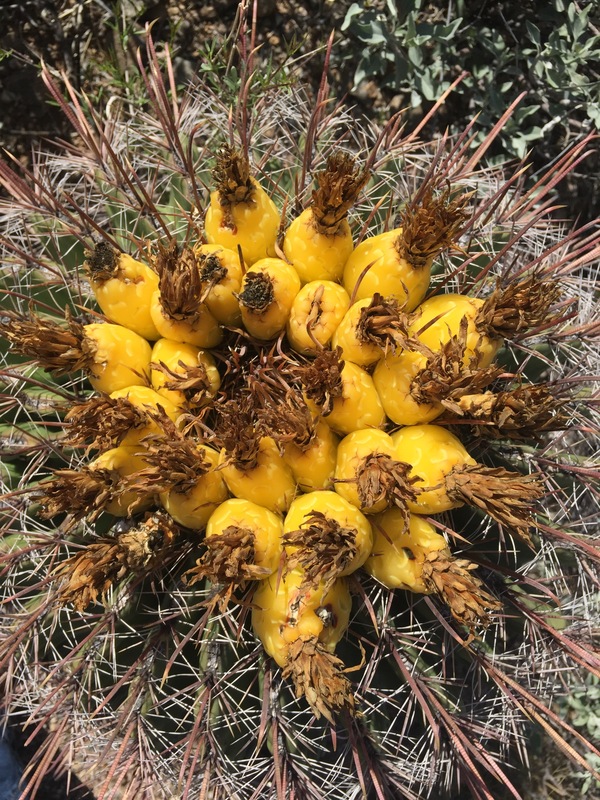 Why Arizona Should Be Your Next Vacation! 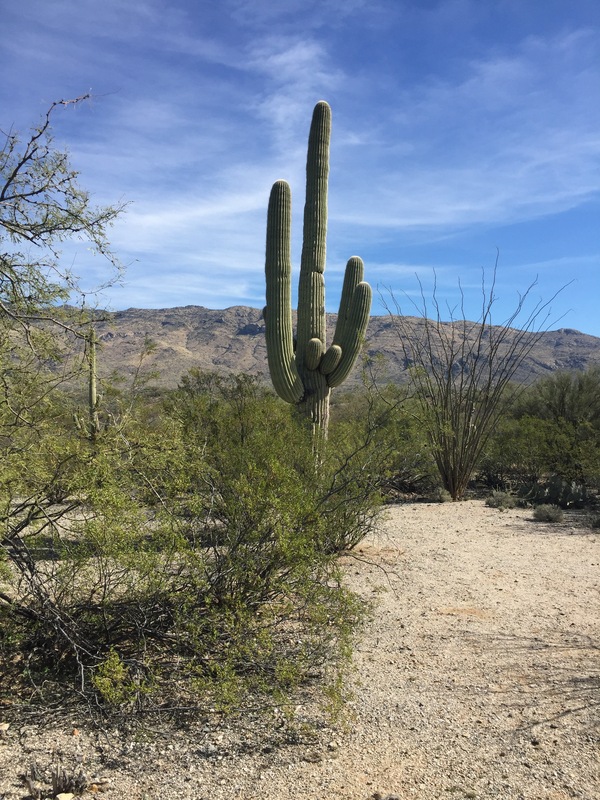 So, if you have been following along, you know that we truly loved our nearly two months spent in Arizona. I have been seriously struggling with my camera and Chrome Book to get them to like each other to no avail. So it’s been annoying to get my good photos onto my blog. I was finally able to get a few downloaded from the camera to the cloud and now to WordPress. A task I have been getting frustrated with and giving up continuously. 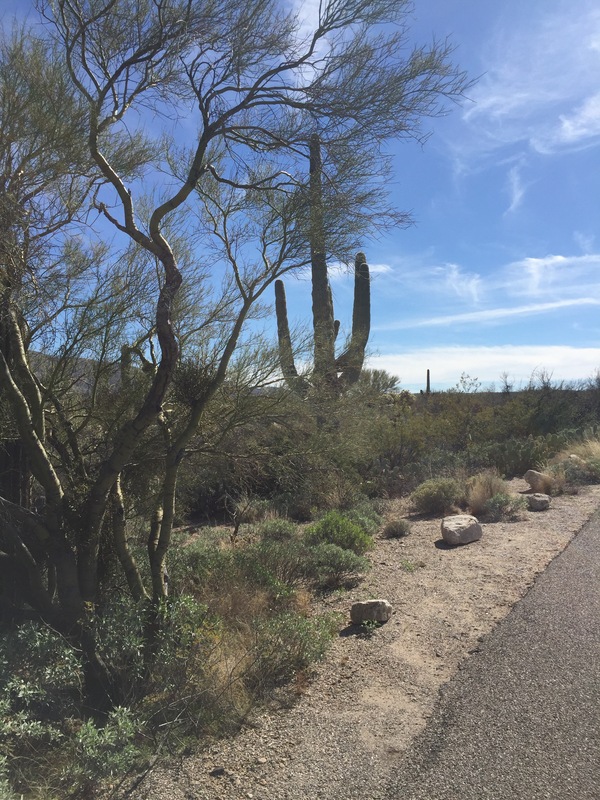 So here are some photos and highlights from the touristy part of our time in Arizona. They are not edited, because seriously, ain’t no one got time for that! Lake Pleasant is located in Peoria, AZ. (Basically) It is really beautiful and there are two sides to the Lake. You can enter through the “harbor” at the Lake Pleasant RV park or through the Regional park on the opposite side. The RV park, where we stayed for two weeks, is nice enough. The facilities are great! However you are parked on top of one another and therefore have no view. I’m sure there may be spots somewhere with a view but we didn’t see any. You can access the lake by boat of course but you can also walk up to it and fish. We never did catch anything off the shore and after talking to several other people, they also had never caught anything off the shore and also never heard of anyone catching anything off the shore. So maybe, if you go here, don’t waste your time fishing. We went to the Regional Park and that was where we hiked for the day. It was really beautiful and also you could fish from there but we did not that day. Going to the Harbor is only worth it if you have a boat or an RV. Overall, it was a beautiful introduction to Arizona. Meteor Crater was definitely one of the cooler things we saw in Arizona. The crater is about 1 mile across and 2.4 miles in circumference and 550 ft. deep. There are three observations decks that you can look through telescopes or walk out on a catwalk over part of the crater. Which I did not do, because I am not insane. I can barely walk out on the third floor catwalk at the Witte’s treehouse much less stand on a metal grate 550 ft above the ground. Big nope right there. It was amazingly windy at the crater, so much so that it was nearly unbearable. If you end up visiting, which I do recommend, be careful what you wear and tie back long hair. Here is Wyatt checking out a piece of the actual meteor with the back of his head, yep hard as a rock (both his head and the meteor). He really enjoyed learning about how meteors hit the earth and did a great job of explaining it later, complete with sound effects. The second picture shows Wyatt searching the sky for the next meteor. Don’t worry we didn’t see any. Winslow was…. an experience. I feel really bad for the little city actually. I bet that maybe at one time (I hope when Take It Easy was written) it was a neat little town. 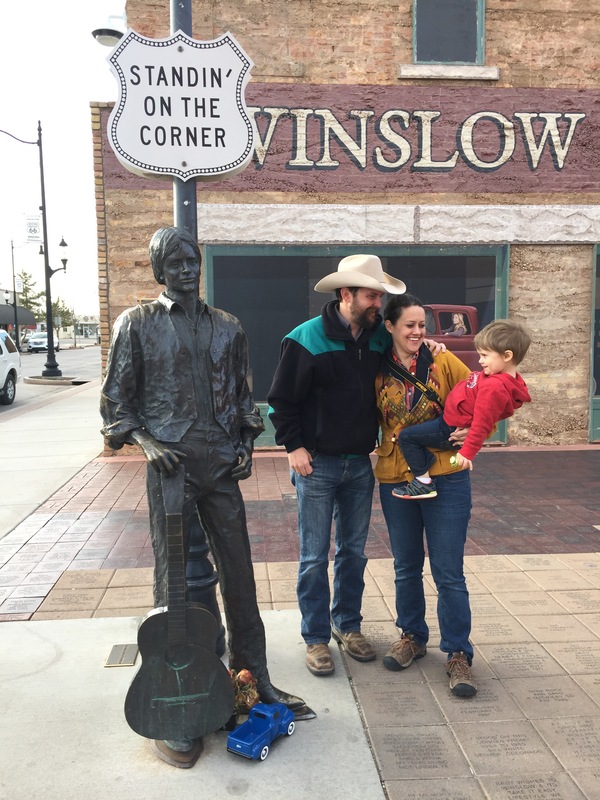 But now, it’s a bit run down and the nicest street that we saw was the one where they had the “corner in Winslow Arizona”. Two bronze statues, a mural and the red flat bed Ford. The people we encountered did not seem like they were having the best days. Interestingly enough, the next day at the Grand Canyon, we overheard a couple telling our waiter they were staying in Winslow because of the song and thought it was going to be this awesome vacation destination and instead they were pretty scared. The waiter encouraged them to not leave their hotel. Yikes. So, if you are a big Eagles fan I would suggest you to drive through, but not to stay. 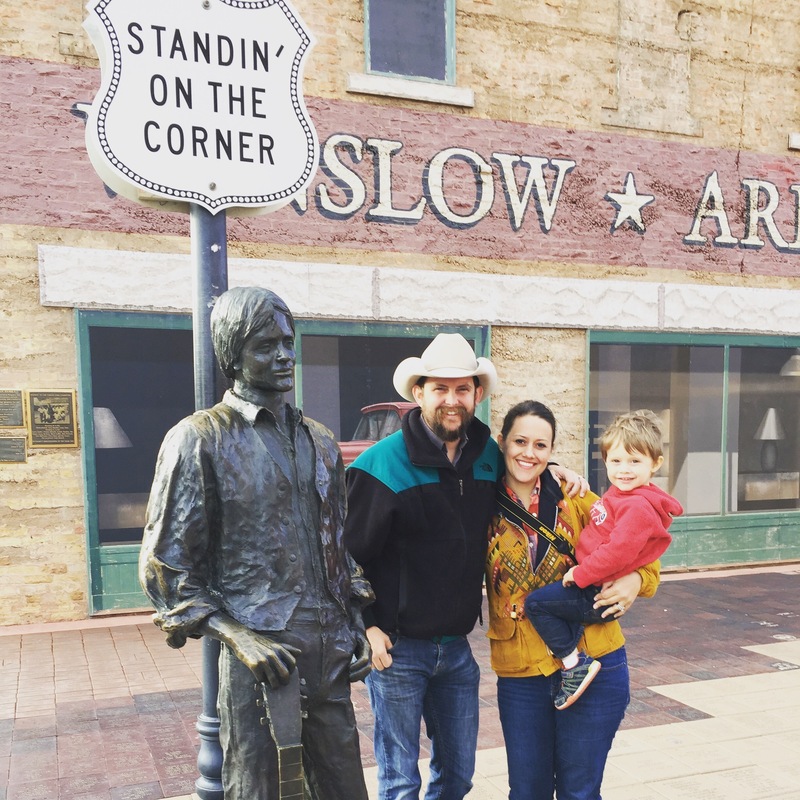 Here, Wyatt expresses his amusement with the corner in Winslow, AZ. This is a must see if I ever saw one! If you are not moved to tears then you need to spend some time here getting back in touch with nature. It was so amazing and in the true sense of the word amazing. Not when you say, “this ice cream is amazing”, but like angels singing, trumpets playing amazing. Get it? Picture it? I really did not take many pictures here. Honestly, it felt really silly to try to take pictures of something that was so huge and deep and colorful and complicated that when you did snap a picture it just looked fake or nowhere near as amazing. Think about the photos you have seen of the Grand Canyon. Even the ones in National Geographic look stupid when you actually see it with your own eyes! So, plan to take a trip there yourself. Stay a few days! We are planning to go back in the summer and do some hiking since it was snowing when we were there this time. We spent nearly an entire day here! What a great state park! This must be on your list to see on your way to the Grand Canyon. There are 5 miles of connecting trails that are for hiking, bikes and horses. Not all are shared trails. We hiked probably close to 3 miles of it and Wyatt did great, only getting tired at the end. There was a more strenuous trail, which we did not take but heard it had a spectacular view. We saw many different birds on the hike as well as Mule Deer bedded down about 3 feet off the trail. We got to a safe distance so we did not disturb them and then took some pictures and watched them as they watched us. Other interesting facts about the park, there are a few houses on the park property that were built there in the 40’s before this was a state park. The main big house that is right in front of the 3 Sisters Butte was built by one of the sisters (of the 3) and according to one label Howard Hughes stayed there as a guest. Fancy. The rocks are red because of the high iron content in them. Bet you could have guessed that. The three main formations that most see photos of are, Cathedral Rock, Three Sisters Butte and the Seven Warriors. Overall – must see hiking destination. Add it to the list! We also really enjoyed both of these National Monuments (free to visit with your National Parks Pass!!). They were SUPER EASY to visit and hike. With Wyatt, who is a great hiker, it is sometimes nice to have totally paved walkways and not worry about your kid landing in a cactus. And because of the easy access to the sites you can make these stops while on your way to something else. This is a great “drive through” park! I bet in the summer it’s pretty popular because you can see a lot without really having to get out of the vehicle. You have the option of stopping and hiking several trails but if you physically can’t do the desert hiking then I would suggest this park. By the way, it was only 70 degrees and by the end of our short 20 minute hike it was super hot and I was worried about Wyatt overheating. We drank lots of water and we were fine, but still, I can’t imagine this hike in May much less like August. 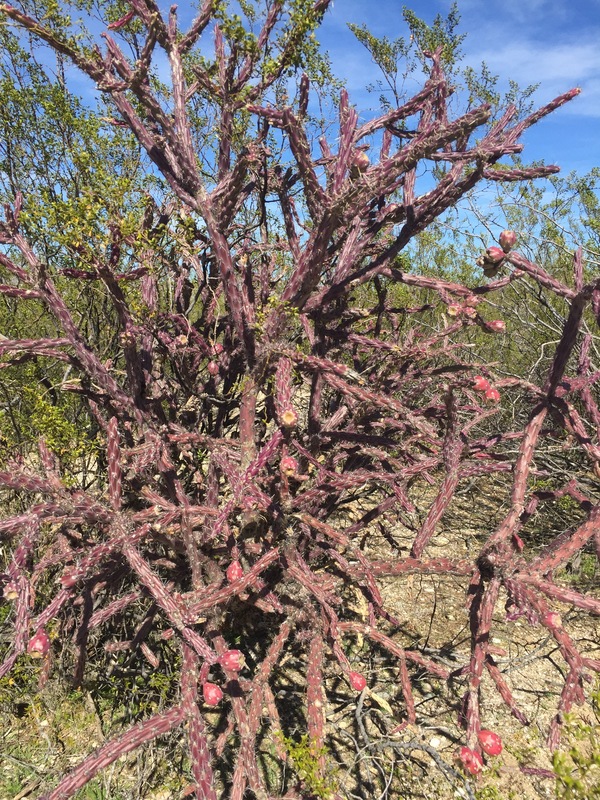 Saguaro National Park is actually split into two parks on either side of Tucson. We went to the eastern park. 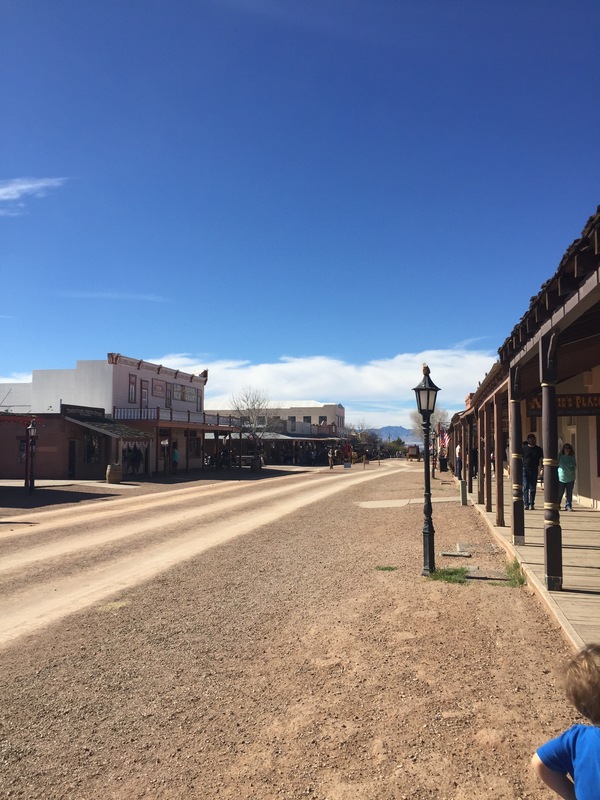 I think if you have read my previous blogs, you may see that we LOVED Tombstone. We loved that it was in the middle of nowhere. The true focus of this town is the actual historical buildings and street, which is really neat. But that also makes it super touristy. There are a ton of souvenir type stores that kind of mess with the ambiance, but I totally get why they are there. The only modern store here is a Family Dollar, so if you need groceries you will be driving about 30 minutes away to the next town. 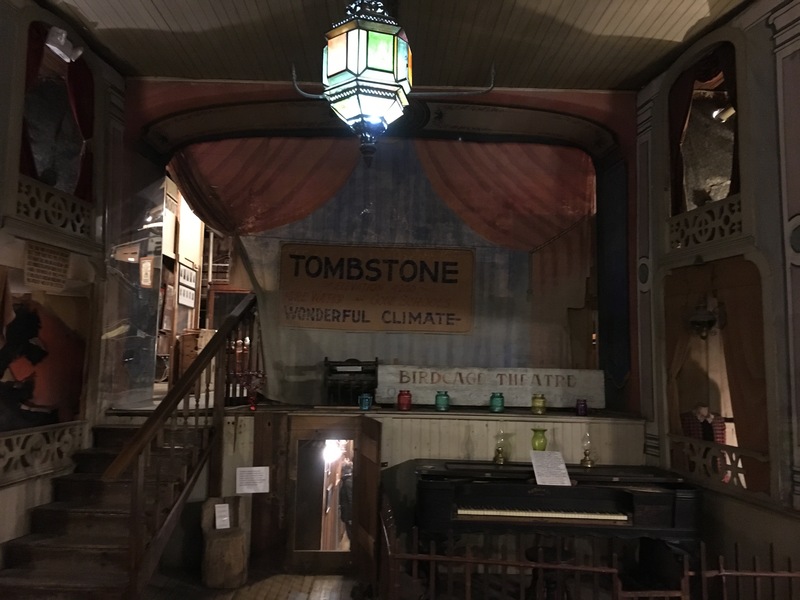 At Tombstone’s peak there were about 110 bars in the town and 3,200 registered ladies of the night, or soiled doves if you will. In the late 1880’s there were around 14,000 people and if I remember right, that really only counts white men of age to vote so that leaves out a lot of people. Including a large Asian population that lived there and who were basically controlled by China Mary who was the much nicer and liked by everyone version of the God Father. She was a true entrepreneur (and her house is currently for sale on Allen Street, FYI). I’m trying to get Rodney to write a song about her, I think it would be interesting. So stay tuned for that one. The Bird Cage Theater. I know you have heard of it. 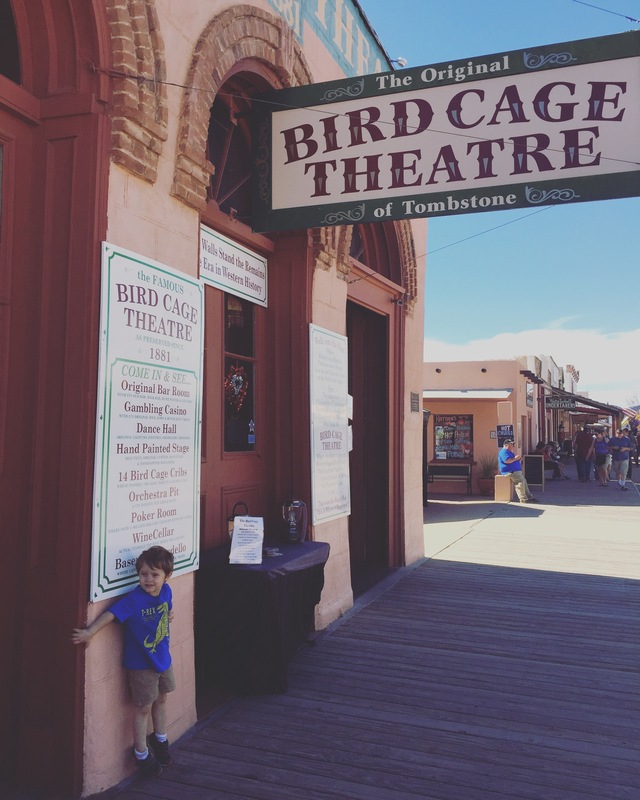 You must have, at the very least, seen the movie Tombstone and remember the scene from inside the Bird Cage Theater. This place is amazing. Everything is still original, down to the decaying wall paper. They have added a wall so that they can keep people in one area until you pay the ticket price to explore the rest of the building. This is such a neat experience for several reasons. One, just to see the theater in its original state is pretty cool, with the piano still in the same place and the bullet holes everywhere, very chilling. 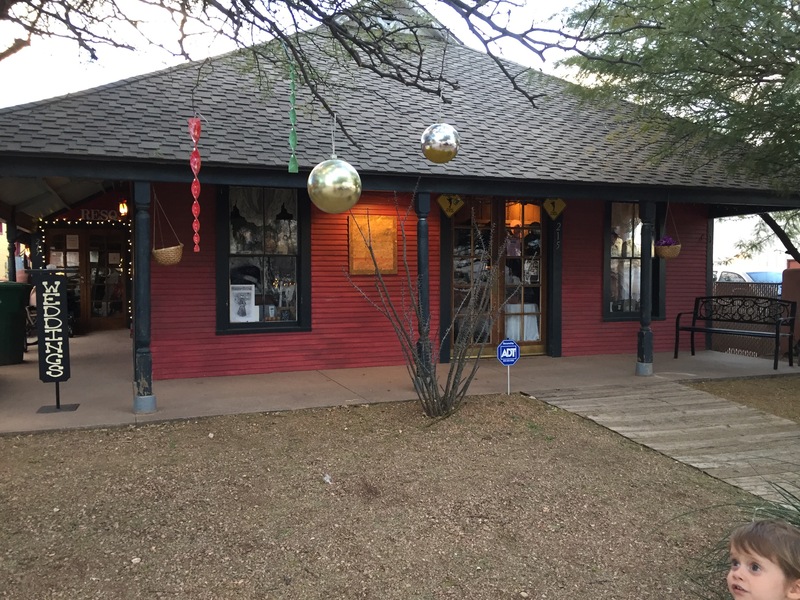 Two, they have kind of turned it into a museum of sorts with tons of stuff on tables and against the walls so that you can see things that were used by the women working there to the piano from the first Episcopal Church in Tombstone. The most amazing thing is perhaps the ghost picture we took. It will be the only picture I post here because I was asked not to post any pictures because they want people to come to the Bird Cage Theater, not feel like they already saw it online. Which is totally silly because holy cow, of course you will want to come here and seeing a few pictures will only make you want to see it more. Below is the photo with the ghost. He is in the doorway under the stage. There was for sure no one down there! Being a part of the Vigilante Days was our favorite experience. We had a blast getting know everyone and explore the town with so many people in 1800’s dress. That was neat. 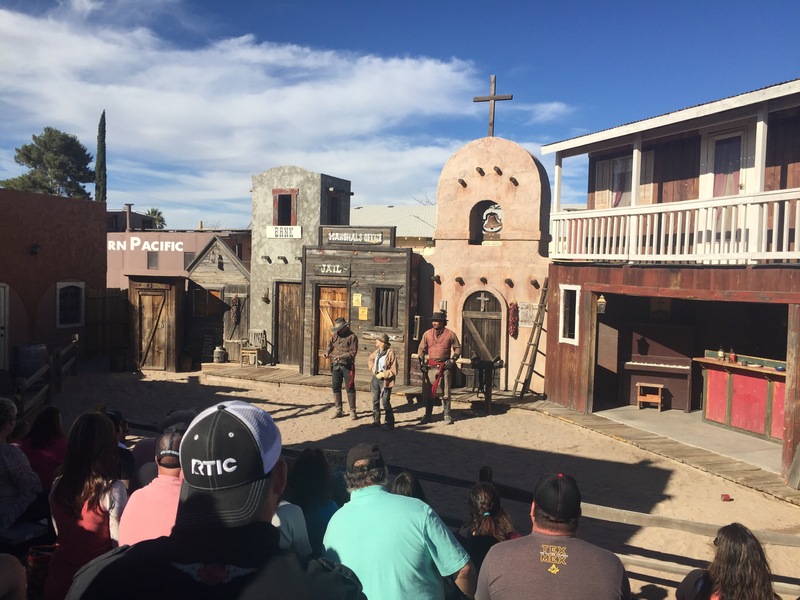 Although, you can see that everyday in Tombstone, there were just more people than usual. So, are you ready to book your trip? I am pretty sure that you could do all of these things in a super action packed road trip that lasted a week and a half. You would be epicly (is that a word?) tired by the end but you could totally pull it off. We will be back for sure hopefully in May, we are re-routing some of our trip so that we can spend more time there. Mostly because the three of us, mostly Wyatt and Rodney, have actually never felt better in our lives. 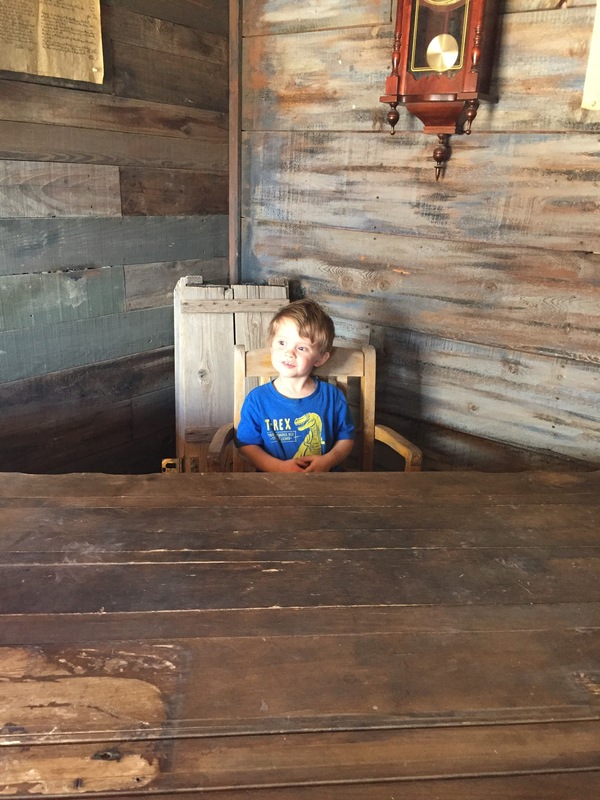 Wyatt had not one eczema flare up and his skin cleared up within the first week and a half. Neither Wyatt nor Rodney had to take their inhalers either! We were allergy, asthma and eczema free for six whole, glorious weeks! (One week back in Texas and poor Wyatt is all red and itchy again). Anyway, you’ll love Arizona! We did! Next Maybe We Are Tiny House People?